The Pousada robe by Abyss is an soft and luxurious waffle texture robe. Besides the standard colors, all 60 Abyss colors are available for these waffle robes at additional cost. These robes are Unisex however they run a little small, our recommendation is to order one size up if that option is available. Made with 100% Giza 70 Egyptian Cotton. 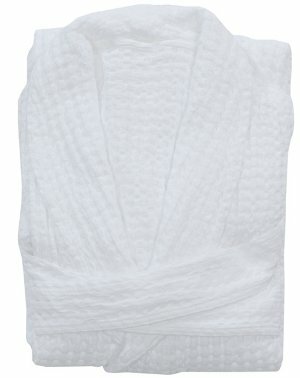 Also available: Abyss Pousada Towels. Made to order in Portugal, usually ships in 4-6 weeks. Please refer to size information below as these items are not eligible for return, exchange or cancellation once ordered. Color swatches available, order swatches from the Super Pile collection. Return ship within 7 days of receipt for refund. Small: Length: 41", Chest Width: 18", Arm Length: 23"
Medium: Length: 45", Chest Width: 19", Arm Length: 24"
Large: Length: 46", Chest Width: 20", Arm Length: 25"
XLarge: Length: 48", Chest Width: 21", Arm Length: 26"